Was in TTE at 120 HP. Now running against Honda S2000's in TTC. Going to have to put on the 40mm carbs or learn to drive better! Geez, look at that flat torque curve....very nice & useable.....go get 'em! I tried. Think its time to hire a coach for a weekend and re-read the rules. See how I can bend them to help me out. I squeezed out a 2:39.8. I never believed that my car could be out of the mid 40s. It was a personal best. That is a pretty nice curve! One question though...Do you have to dyno on a DynoJet inertial dyno for NASA classification? I bet if you reran on an eddy brake (like a Mustang, etc.) you'd see ~15% less power. Not sure if that would help your classing but just something to think about. Inertia dyno's calculate power by measuring acceleration rates of the drum. They assume a drive line inertia, probably much higher than that of a Type4 motor/914 trans/small wheels because most motor/trans/wheel packages are much higher inertia, which will result in a higher engine power reading than is correct. Edit: Some DynoJets also have eddy brakes, so you'd have to check which kind your shop uses. Just trying to help out with your classing if possible; it seems rather unfair. NASA only accepts the Dynojet, no Mustang dyno pulls. I don't believe that my car makes 160hp. I wonder what my face looked like in front of my peers when he said 160hp. I bet my mouth was on the floor. 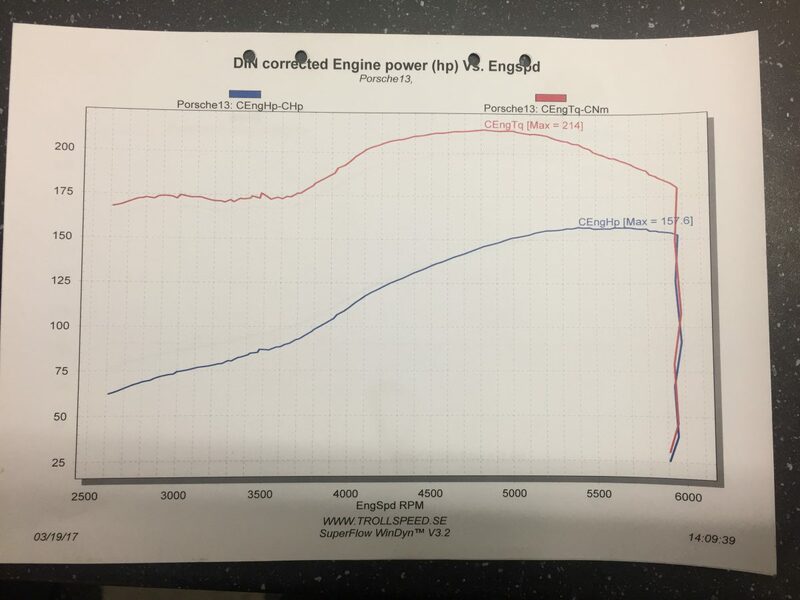 It was hard to dispute the numbers to the group when the three spec miatas in front of me and the two cars after me pulled what they expected on the same dyno. Like I said, I dont believe it. I did do my best time ever though. 2:39.8. Three seconds slower that a supercharged Miata with 225/45 on 9 inch rims. Gotta say that you're really getting into the groove going under 2:40...My /6 (205Hp, 2000lbs on 245/45/15's) was typically in the 2:41-2:43 range, so you're flying! That's disappointing. Unfortunately, the operator can play a huge role in indicated power. The rate they ramp or correction constants can really affect the final output. Best time ever is awesome though, congrats! Thanks for sharing you dyno, my displacement is 2258. Car has 44 Webers, 163 Webcam and Tangerine headers too. Its reassuring that we are at similar numbers. I bet the next time you make it down here you'll best my time. Doing 2:40s on that bumpy track is flying. Here's my ~158 hp curve. 2258 cc, Web 86b/c Cam, 44/38 Valves, 40mm ITB's and stock 2.0 heaterboxes and banana muffler. Not at linear as the previous graphs. What Heads are you guys running? I just built a 2256 with dual webers and a 86B cam. I have stock 2.0 heads cut for the dual springs. Have you done any porting etc. to get these HP numbers? What pistons/cylinder combos are you having success with? My engine has 1.7 heads thats been welded up and converted to the 2.0 position of the sparkplug, not sure what porting has been done as I havnt built the engine myself. It uses original 94 mm cylinders rebored to 96 mm and KB pistons. 96mm cylinders with JE pistons. Had some special coating added to them to help with heat. My heads came with the car. No idea who built them. 48x38 valves, 2 liter plug placement. Duel spring too. Think they maybe came from Fat Performance.